Denny’s is using The Force to jazz up its menu. 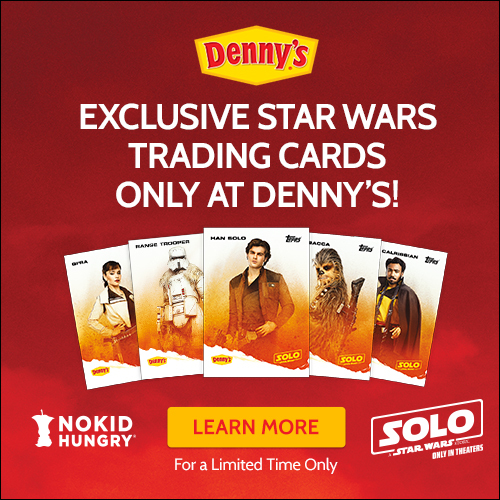 On Monday, The Spartanburg, S.C.-based restaurant launched a series of exclusive promotions tied to the soon-to-be released “Solo: A Star Wars Story” movie, including trading cards and limited-item meals inspired by the film. The LucasFilm collaboration kicked off Monday with a 60-second national commercial featuring young rivals Han Solo and Lando Calrissian. In the spot, titled “Hand of Sabacc,” the pair are playing a high stakes game of cards in a lodge bustling with colorful galactic characters including Chewbacca. Denny’s said they worked with LucasFilm to ensure the set design captured the authenticity of the movie. The game ends with the young boys fading from fantasy to reality. They are sitting in Denny’s booth trading Solo-themed cards over breakfast. Though the movie doesn’t debut until May 25, the 12 trading cards and new dishes can be purchased now at the company’s 1,700 restaurants. The new dishes are available for about three months. A portion of the sales from the trading cards, which cost $3 for a two-card pack, will be donated to No Kid Hungry. The organization helps provide meals to children in need. The Solo-themed campaign is part of the full-service chain’s ongoing revitalization effort, Chief Marketing Officer John Dillon said during a media event held at the famed El Capitan Theatre in Hollywood. The Denny’s brand overhaul has included tweaks to its menu, remodeling stores and expanded on-demand delivery options for diners. Dillon said one of the major changes Denny’s made to its menu is to upgrade its pancake recipe, which now uses buttermilk and fresh eggs. “We owed it to [guests] to take it from good to great,” he said. Diners can get a taste of the new recipe on the Co-Reactor. The new Star Wars dish is a pancake stack topped with fresh strawberries, strawberry sauce and whipped cream. Denny’s adds a twist by serving the dish with a side of warm citrus sauce and Crystal Crunch Rocks. The acid combined with the sugary pebbles ensures that every bite comes with a pop. Other dishes include an egg white breakfast called Lightspeed Slam, Two Moons (a skillet breakfast with eggs and gouda cheese sauce) and Blaster Fire (a chipotle gouda cheeseburger with a spicy ghost pepper sauce). Denny’s is also selling a Crystal Crunch milkshake. Denny's also debuted a higher quality coffee Monday. The Colombian blend is made with 100 percent Arabica beans and grown and harvested "in a sustainable manner," Denny's said.